Not missing a bit, the Indochino Traveling Tailor is rolling into the next town, this time visiting Philadelphia from May 10 to May 27. If you book an appointment in advance, you get a free shirt and a free gift set (if you end up buying a suit). You can book your appointment right here. As usual, you have the benefit of being measured by a dedicated specialist and see and fell all the fabrics and options in person. Indochino celebrated their 100.000th Facebook fan the other day and decided to do one of their popular sweepstakes as a thank you to their customers. As long as your are on Facebook, you can easily participate by starting at their Facebook status message (like & share) and then following the instructions. 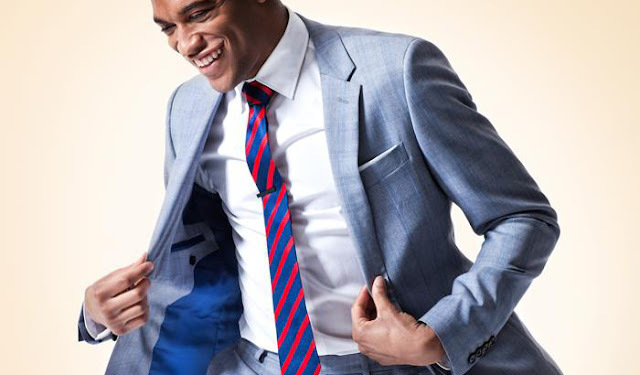 You can win a premium 2-piece suit worth $599. The sweepstake ends on May 10th, 2013. I should receive my order from the 2013 Spring Collection soon and while the collection is of course not the most recent anymore, I had ordered a couple of items that will still be interesting for everyone to see. Amongst others, I have chosen a half-lined blazer and finally ordered a pair of their Boca Chinos.